Pop in to Oxfam and join in with Shirley Small Faces. 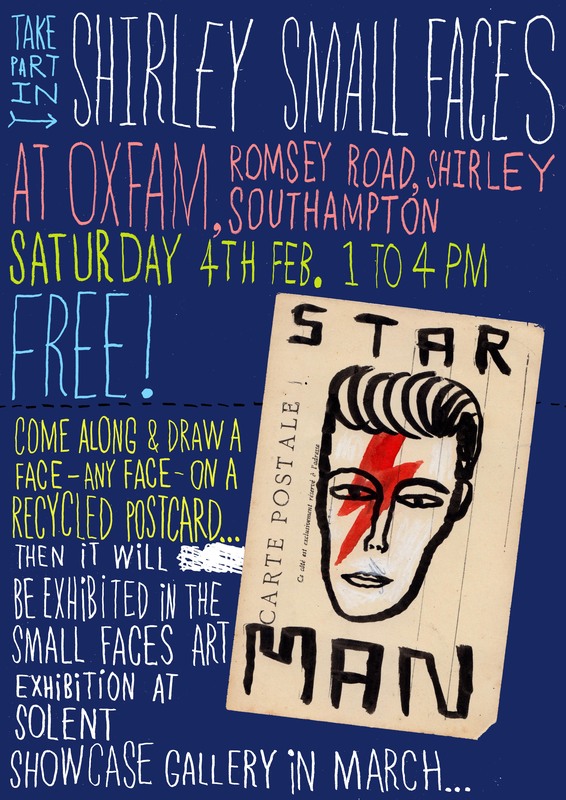 Come along and draw a face – any face – on a recycled postcard. Then it will be exhibited in the Small Faces art exhibition at Solent Showcase gallery in March and April. Or just come and say hi and talk with us about Shirley. What’s it like living here? Who are the people who make Shirley? What creative talent exists in our suburb? This is organised by two local residents – illustrator Jonny Hannah and community project person Rebecca Kinge. It’s all free, we look forward to seeing you there. Mr M A Biffin on Ex Civil Service Sports Ground in Shirley, Southampton.